0:00:59.718 E/SCN: Failed to find resource 'objects/industrial/EU/IND27.10x19.00.obj', referenced from scenery package 'Custom Scenery/Aerosoft - Svalbard - ENSB/'. I can't find a folder "objects/industrial/EU" in my X-Plane folder(s). Neither in the actual scenery folder for Svalbard nor anywhere else. Also, where would one have to copy the extra livery folder for the B200? I assume you would only have to do this when you have the Carenado B200? Any help is appreciated. And as a hint, a documentation / manual would be nice, but perhaps I overlooked it? As a follow-up: I did find the manual now. It may have been too early this morning so I didn't spot it :). I also did a re-download and re-install of the scenery because somehow all files seem to be duplicate after the extraction - I might have extracted the archive twice - so, presumably my bad. That said, the issue with the missing resources remains. So any help there would be appreciated :). i have sent the problem to the developer. Many thanks Heinz. Looking forward to the update :). The missing resources have already been fixed. We are waiting for aerosoft to upload the update. Many thanks Marten for the quick reaction. Highly appreciated. You can install World2XPlane Model Library in the meanwhile, it solves the conflict. Thanks for that hint. However, I had not and did not plan to install W2XP because with XP11.11+ this shouldn't really be necessary? I think XP11.10 overhauled all objects, in particular in Europe, thus at least for me I don't see the need for additional models. It may solve this particular conflict, but I'd rather have a lean XP installation and wait for the models from the developer :). But in any case, many thanks for the tip :). #metoo. I made a complaint to Aerosoft GmbH. I received rapidly a satisfying reply from their Customer Service. Thanks Heinz. In the mean time I resolved the "missing resources" problem after installing the Svalbard4XPlane product, by downloading "World models 0.8.0" library from the website X-Plained.com. See the attached edited screenshot. You have to sign-up to be able to download this library. 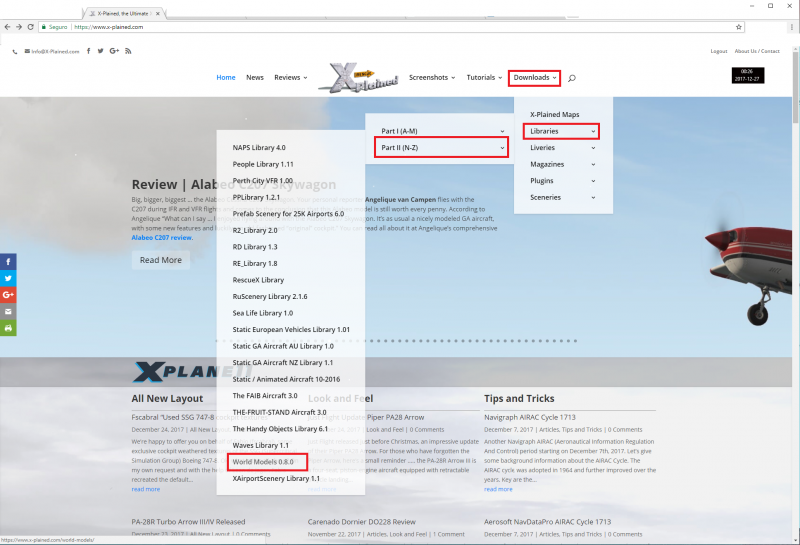 Copy this library folder and all its subfolders to the "Custom scenery" folder of X-Plane 11. All the "missing resources" will now be found and the "BE ADVISED" pop-up window regarding Svalbard4XPlane at the start of X-Plane 11 will not appear any more. At least it did on my PC (MS Windows 10 Pro, Version 1703). Sure my solution is a temporary work around. The developers should have included these resources into the product. It sure was a mistake to leave these resources out of the package. A scenery package that is sold for € 46.46 should work flawlessly out-of-the-box. I feel that the product also is missing an installation instruction at the top level in the package. That could have been a simple README.txt or so. After unpacking the .zip file and traversing most of the subfolders I found a user manual. I also think that Svalbard4XPlane should come with an installer as many of the payware sceneries sold by Aerosoft GmbH have. Even if the developers have the opinion that installing a product like Svalbard4XPlane is a simple thing to do. Not all customers are professional PC users. They want a "quick and easy" install. Not having to dig for a manual first and then spend more time to learn how to install the add-on. It is a pity that Svalbard4XPlane came out with these shortcomings because the scenery itself is very nice. The past days I made several flights in the area. I even made a night flight from ENSB to ENSA. Beautiful. I also happened to spot the aircraft carrier USS Nimitz in the vicinity of ENSB. I made a successful deck landing on the Nimitz with a Cessna 172. The rest of what I saw and heard that very moment I leave for you to discover. I wish y'all many happy landings in 2018 especially in Svalbard (Spitsbergen). I had not and did not plan to install W2XP because with XP11.11+ this shouldn't really be necessary? I think XP11.10 overhauled all objects, in particular in Europe, thus at least for me I don't see the need for additional models. Just for explanation: The W2XP library does not add any objects at all to what you see in regular autogen (and only for this some objects were added in 11.10). But this library is used by a lot of scenery as requirement, in particular freeware scenery, so it's good to have it installed anyway (except you are short on HDD space). Many thanks Heinz. Just to report back: The scenery now works flawlessly.